When you live in a city where $1,000-plus tasting menus are not unheard of, finding an affordable prix fixe dinner is almost like claiming you saw a unicorn in Central Park. While we can’t speak for magical horses, we can assure you that reasonably priced tasting menus ($100 or less per person, for our purposes) are not a myth. From a Brooklyn hot spot that’s drawing millennials like bees to honey to a purely meat-based meal (and one dedicated to dessert too), you can have a bougie night out without blowing your whole paycheck. 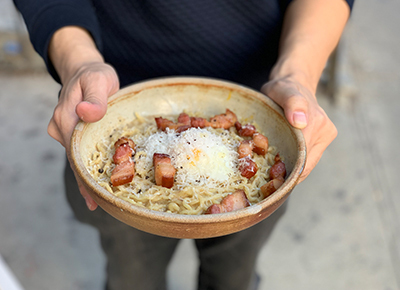 NYC’s first-ever Vietnamese barbecue restaurant, from husband-wife duo Yen “Madame” Vo and chef Jimmy Ly, is a modern take on Vietnam’s communal tabletop grilling. The “meat” of the menu is Ly and Chef John Nguyen’s bo bay mon, a traditional Vietnamese feast spotlighting beef in seven courses. Start with the bo tai chanh carpaccio and work your way through six more savory courses. Make sure to save room for the last dish (a fan favorite): chao duoi bo, an oxtail congee with a honey–fish sauce brown butter. The tasting menu also includes fresh vegetables, herbs, pickled daikon, rice noodles and rice paper to make your own rolls. This LES hot spot serves an ever-changing six-course tasting menu made with local and seasonal ingredients by chef-owners Jeremiah Stone and Fabian von Hauske (also of Wildair and Una Pizza Napoletana). Think monkfish with wild spring onion and romesco, veal with mushroom and spinach, and caramelized hazelnut, honey and chocolate. There’s a veggie offering too, so even non–meat eaters can have the full tasting menu experience. Considering the restaurant holds a Michelin star and two stars from The New York Times, the under-$90 price tag is practically a steal. Atoboy brings modern Korean fare to New York City via a banchan-inspired tasting menu by executive chef/owner Junghyun “J.P.” Park. For $46 per person, the meal includes homemade kimchi, a choice of three banchan-style dishes and rice—all of which are encouraged to be shared with the entire table. And with dishes like pork belly with gang doenjang (soybean stew), sunchoke and black truffle, and yellowtail with kombucha, you’ll want to make sure you get a bite of everything on the menu. Work your way through Eastern Europe via a series of inventive dishes. The five-course tasting menu showcases seasonal global cuisine influenced by chef Jeremy Salamon’s Hungarian heritage. At $75 per person, you can explore Anaheim pepper schnitzels, stuffed cabbage with wild rice and pecans, beet tartare, and dumplings with roasted eggplant, to name a few of the elegant offerings. Why shouldn’t sweet tooths get their own tasting menu? The six-course “sweet and savory” dessert menu from pastry chef Rory MacDonald can be found beneath the high-end Flatiron pastry shop in a Prohibition-era speakeasy cocktail bar. It’s truly a combination of theater and gastronomy, opening with a first course like olive-oil gelato garnished with lemon, olive oil and sea salt and served with liquid nitrogen, which releases the aroma of eucalyptus as you eat the ice cream. There’s also miso–pink grapefruit meringue and boozy gummy bear “shots.” The menu comes in at $75, with add-on options such as a $9 cheese course. We know what you’re thinking: Lexus? Like the car? But this luxe café and gallery space in the Meatpacking District (from, yes, the auto brand) also has a restaurant that features a global rotating chef-in-residence program. Currently in the kitchen is the second chef-in-residence, Sergio Barroso of Restaurante 040 in Santiago, Chile. For April, Barroso is offering a 12-course small-plate tasting menu for $95 per person, featuring dishes like salmon with confit garlic ice cream, butterfish nigiri and an oxtail sandwich. Chef Matt Lambert interprets New Zealand fare with French techniques in the Michelin-starred Musket Room’s cozy dining room. The $75 three-course tasting menu gives guests a choice per course, whereas the $95 Short Story menu features six courses divided into “chapters” (there’s also a Long Story menu at $160 per person). The inspiration here is a Maori creation story of the sea (seafood), land (meat) and sky (desserts), with dishes that draw from the indigenous New Zealanders’ customs, such as mandarin sorbet and hangi, a traditional method of cooking meat by burying it with heated stones. The wine list is made up almost entirely of (excellent) New Zealand wines. Save yourself the airfare and indulge instead in the inventive twists on Southeast Asian dishes through this five-course tasting menu by Top Chef alum Leah Cohen. The meal includes four savory courses and one dessert. (Make sure to ask for off-the-menu items like bun cha and Thai-style popcorn chicken.) The well-priced tasting menu is available Sunday through Thursday and changes on a weekly/seasonal basis. OK, this one clocks in just over budget, but it might be the only way to eat at a Wolfgang Puck location and not break the bank. Located at the Four Seasons Downtown, Cut by Wolfgang Puck actually has a fairly affordable four-course menu that includes Japanese Wagyu, hand-cut tortellini with truffles, and oysters with caviar. The offerings change on a nightly basis, which means the chef creates a unique experience on the fly every evening.